So what set me on the Road to Raw? It didn’t happen all at once. In fact, it very nearly didn’t happen at all. It was a long process. First I had to embrace vegetarianism. Our best friends were vegetarian and we respected their choice, happily eating vegetarian meals whenever we got together. But we just felt we were fitting in. It didn’t really cause us to think about the issues. We never discussed it with them. Then our son was born, we moved away, led separate lives and I thought no more about it. Until my son was two and a half. By now I had developed a love for cooking, my son did too, and as the fad for adding bran to all things edible took hold, we graduated to baking wholemeal bread and scones, pizza bases and cakes. We substituted Flora for butter as we were urged to replace saturated animal fat with polyunsaturated margarine ‘for a healthy heart’. I became more interested in food and health. We often went to the local library, he chose Richard Scarry and I optimistically chose sewing – I never did make that quilt – and books on conscious eating. One of these I recognised. My vegetarian friend had mentioned it when we had talked about my newfound interest in food and health. Frances Moore Lappé’s * Diet for a Small Planet is about eating to protect the planet’s resources: she maintained that adopting a meatless diet was the only way forward because a meat-based diet was not sustainable. Lappé also posited the theory of protein complementarity (bear with me, here comes the science bit!). She advocated combining certain protein-based plant foods at the same meal to ensure you had a complete protein to replace the meat protein. So, for instance, brown rice, lentils and nuts on the same plate. * (see below). 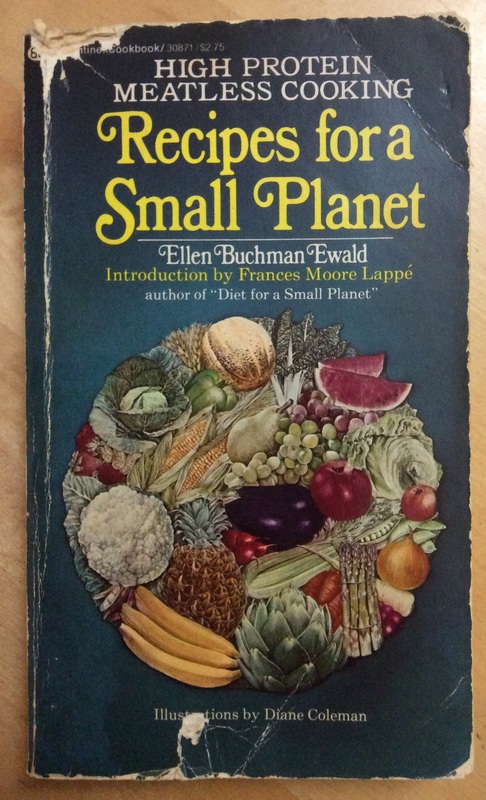 Later, I discovered its sister book written by her friend, Ellen Buchman Ewald: Recipes for a Small Planet. Ewald developed high protein recipes to simplify this process of complementarity for would-be vegetarians. This became my bible for quite some time – as you can tell by the photo! (the cat liked it too – see nibbled corner). She does use soya quite a bit but she also introduced me to carob, which I love! Her high protein Gorp cookies were a family favourite. 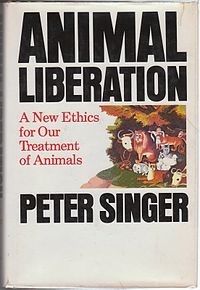 The other catalyst was coming across Australian philosopher, Peter Singer’s book Animal Liberation: A New Ethics for Our Treatment of Animals, which popularised the term speciesism and was not so much advocating equal animal rights, but rather their right to consideration and equal treatment as sentient beings who experience pain. Together with the government campaign to cut down on animal fat, these books propelled me down the road to vegetarianism. It was far from easy. My husband and son were not at all impressed that mince and bacon were no longer on the menu and we all reneged at using TVP (textured vegetable protein), which admittedly tasted like cardboard! And this was at a time when you were lucky to get a wilted salad if you ate out or visited friends – we ate a lot of omelettes! – and you were never invited to dinner parties. By the time our daughter came along, we were fully-fledged veggies. I had a vegetarian pregnancy and was so much healthier than the first time, when I seemed to live off cheap meat and orange ice-lollies! She became a strong, healthy, vegetarian baby determined to run before she could walk. We now shopped at Beano, then a small local co-operative selling legumes, oats, wholemeal flour and so on out of barrels. As I learned, so did my son, mixing up lurid concoctions of herbs and spices that he now uses on an everyday basis. He was particularly proud of the turmeric, curry powder and chilli combo, which turned out to be portentous as now every meal he makes or eats has to come with chilli on the side! 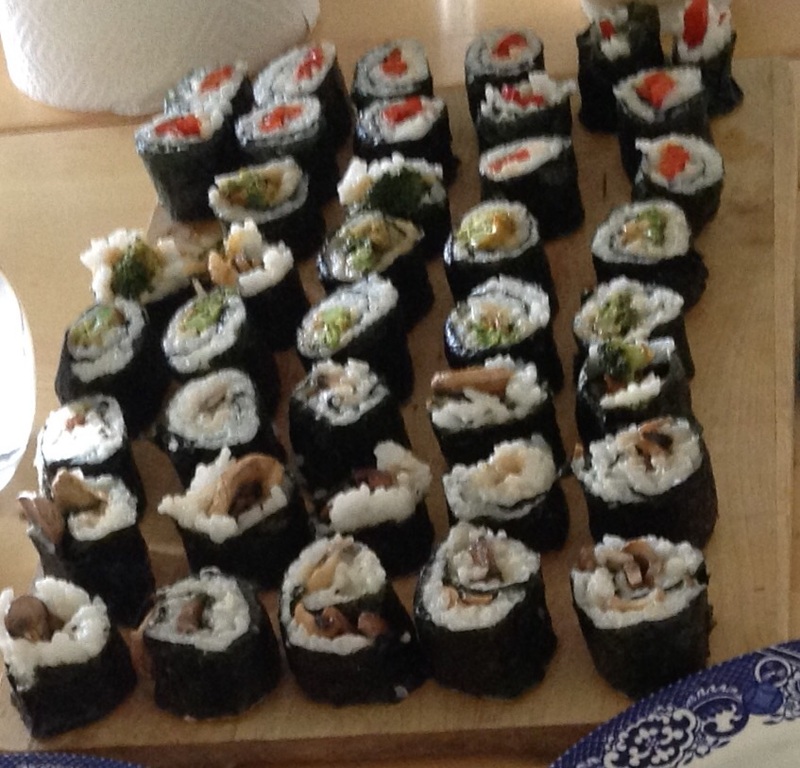 Vegetarian sushi made by my daughter. 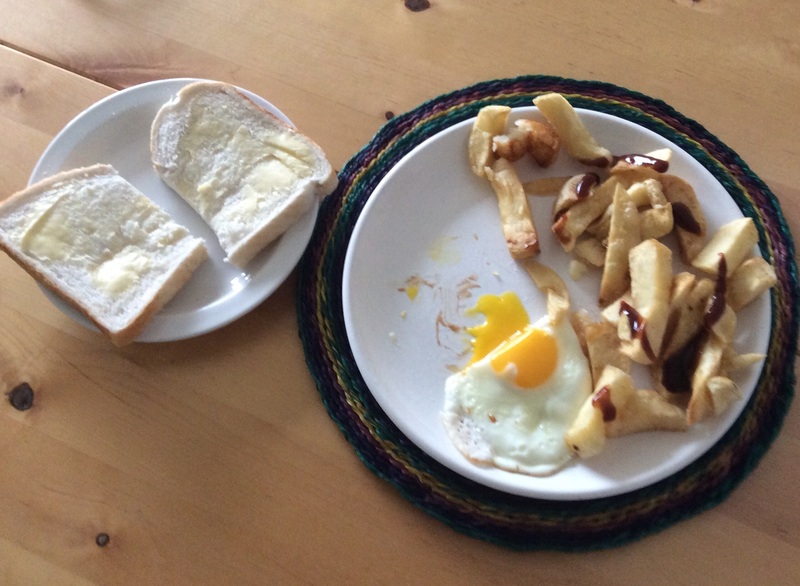 Which would you rather have: a plate of vibrant, tasty sushi with tamari or chilli sauce, or a beige meal of processed white bread, margarine, deep-fried chips and fried egg? Next time, I’ll write about how I found my raw energy! *This is because most plant proteins don’t have a full complement of the amino acids essential for the human body to develop, repair and renew. More recently, this theory has been amended in that it is now believed complementary proteins only need to be consumed within the same day, not necessarily the same meal. Posted on November 11, 2015 March 1, 2016 by thejuicenutPosted in Book, RecipeTagged complementarity, cooking, Diet For a Small Planet, Environment, food, health, Meatless, Protein, Recipes for a Small Planet, Sushi, Vegetarian.